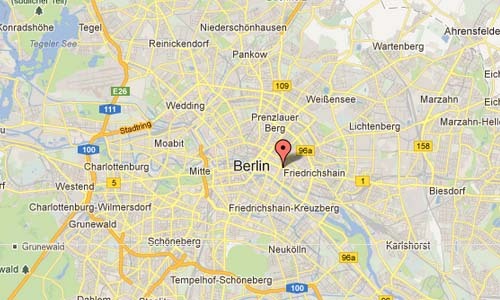 The Strausbergerplatz is a large urban square in the Berlin district of Friedrichshain and marks the border to Mitte. 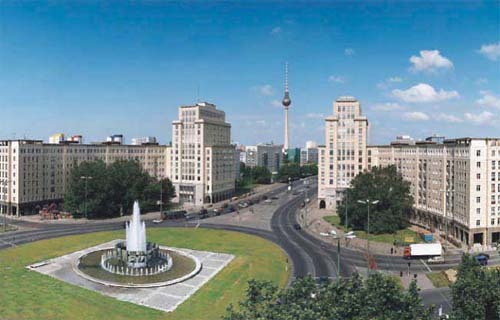 It is connected to the Karl-Marx-Allee to Alexanderplatz and the Lichtenberger street with the square of the United Nations. These two roads intersect at an oval roundabout at Strausbergerplatz. The houses on Strausbergerplatz are like in the rest of Karl-Marx-Allee complex design and predominantly own eight floors. The ground floor of the houses being built as a loading zone. The four outputs are designed torartig. North and south of the road Lichtenberger this is achieved in that the stressed corner houses nearly come close to the road and the footpath passes through it. The gatehouse at the east and west side stand next to their special design distinguished by its height. The eastern end of the course consists of two 10-storey buildings, and the western entrance are two 14-storey high-rise buildings. 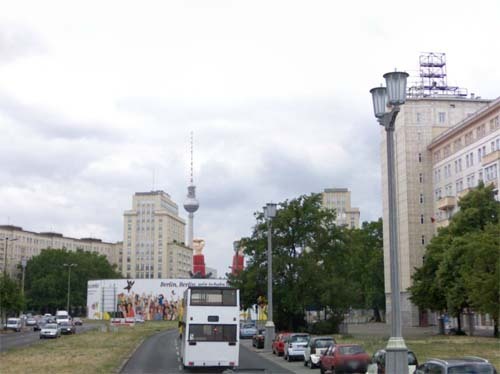 These were called “House of the Child” and “Berlin House” built and were in contrast to the other buildings of the Stalin Allee in the 1950s, built as prefabricated buildings of reinforced concrete components. The Fernsehturm (English: television tower) is a television tower in the city centre of Berlin, Germany. 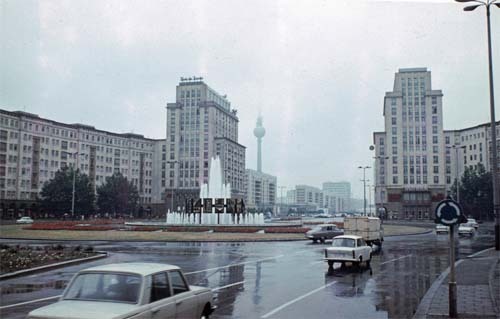 Close to Alexanderplatz, the tower was constructed between 1965 and 1969 by the former German Democratic Republic administration who intended it as a symbol of Berlin, which it remains today, as it is easily visible throughout the central and some suburban districts of Berlin. With its height of 368 meters, it is the tallest structure in Germany. The original total height of the tower was 365 metres, but it rose to 368 metres after the installation of a new antenna in the 1990s. The Fernsehturm is the fourth tallest freestanding structure in Europe, after Moscow’s Ostankino Tower, the Kiev TV Tower and the Riga Radio and TV Tower. There is a visitor platform and a revolving restaurant in the middle of the sphere. The visitor platform, also called panoramic floor, is at a height of about 203 metres above the ground and visibility can reach 42 kilometres on a clear day. The restaurant Telecafé, which rotates once every 30 minutes, is a few metres above the visitors platform at 207 metres (originally it turned once per hour; the speed was later doubled following the tower’s late 1990s renovation). Inside the shaft are two lifts that shuttle visitors up to the sphere of the tower within 40 seconds. It is not accessible by wheelchair. There is also a Staircase with 986 steps. More information on en.wikipedia.org and de.wikipedia.org.